Narrator: Man... probably the most mysterious species on our planet. A mystery of unanswered questions. Who are we? Where do we come from? Where are we going? How do we know what we think we know? Why do we believe anything at all? Countless questions in search of an answer... an answer that will give rise to a new question... and the next answer will give rise to the next question and so on. But, in the end, isn't it always the same question? And always the same answer? Contains a cello sample of "Black Hole Sun"
Q: Is it possible to follow Lola's route? Q: How much is 100,000 Deutsche Marks worth? Q: Who was the man in the ambulance? Tom Tykwer has truly proven himself as the filmmaker to watch. The little known German director has produced a modern-day masterpiece; a dazzling technical film about how life consists of the decisions we make. Lola (Franka Potente) receives a phone call from her boyfriend, Manni. (Moritz Bleibtreii) Manni accidentally leaves a bag carrying $100 000 on a train, which is picked up by a homeless man. This leaves Manni in quite a predicament. He is supposed to deliver the money to a gangster by noon, if he fails, then he is likely to be killed. Lola has twenty- minutes to save his boyfriend. Twenty short minutes to somehow find the money and get it to him. Run Lola Run is a film you expect to see at a Independent film festival, or in a Professor's office at a film school. In no way do I mean that in a negative way, I mean not to intend that the film is of a lower standard with lower production values, rather that the film is a beautifully mastered technical film that uses every filmmaking technique in the book. It is refreshing to see a film like this in the midst of the commercialised, dry-cut, 'traditional' filmmaking that we see on the silver screen so regularly. As stated before, the film attempts to use a wide range of filmmaking techniques to help get the director's meaning and vision across to the audience. Some of these include speed-up, instant replay, black and white, and even animation in some parts. Tykwer wrote and directed this film, and while doing this, he never lost sight of his meaning. His meaning that he is trying to express is that life consists of the decisions we make. While watching the film, this becomes increasingly evident. He also likes to emphasise that time is against Lola during the film. This can be seen when a young woman walks past and Lola asks her for the time, the next shot shows a much older woman answering her question, hence showing the importance of time. Franka Potente gave a good performance as Lola. Yet, it is hard to say that she was fantastic, because it is a role that requires a great deal of physical acting and we didn't get to know a lot about Lola, hence the film wasn't overly-focusing on her issues, rather her boyfriend's problem. The real standout performance from my point of view came from Moritz Bleibtreii. He actually took on a quite challenging role and pulls it off successfully. He achieves his objective of getting the audience to feel sympathy for the position that he is in. 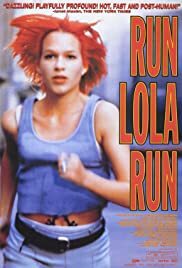 Run Lola Run is without a doubt, one of the best technical films ever made. A profound, exciting, new age masterpiece that has well and truly left its mark on the film industry. 179 of 224 people found this review helpful. Was this review helpful to you?